Steggo…Welcome to New York. It’s Been Waiting For You. Yellow Goat Design introduces you to New York’s finest. 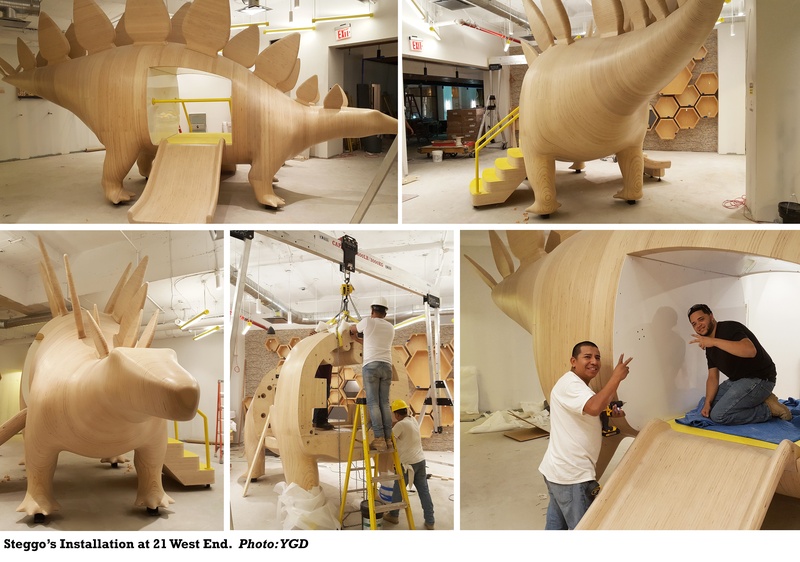 Meet Steggo, our 30 foot life-sized dinosaur designed and fabricated for The Dermot Company’s latest development: 21 West End luxury apartments on the Upper West Side in Manhattan. If you want to catch a glimpse…you’ll need to know an insider. Located on the ground floor in the kids play area, NY’s hottest celeb is safe from the flashing lights of the paparazzi. This city slicker may be slow (the stegosaurus only walked 5 mph compared to his counterparts) but he sure is steady! Steggo’s fins and blades are reinforced with steel rods and he was installed overall in twenty strategic sections outlined in the detailed shop drawing package. 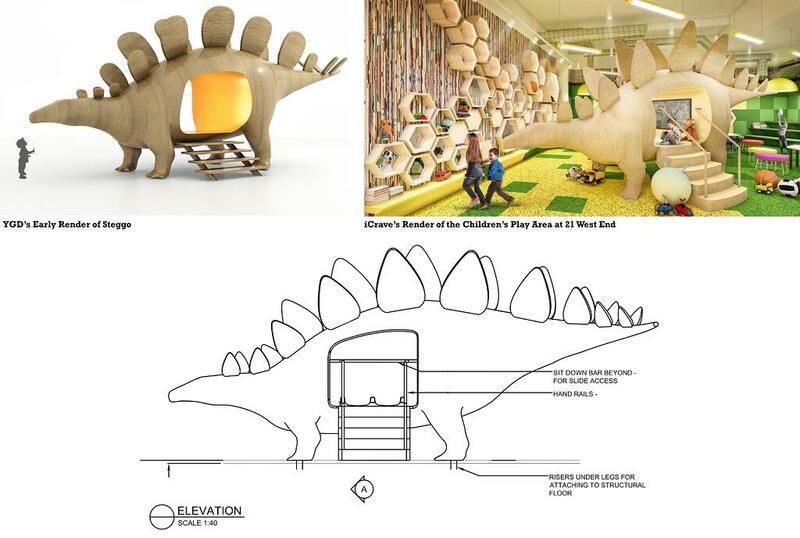 Steggo’s design went through a few different iterations before final approval. YGD’s safety consultant spent (many!) hours studying and surveying the drawings before signing off to ensure it met all applicable codes. We definitely tested her knowledge throughout the process so big shout out for her smarts and support! 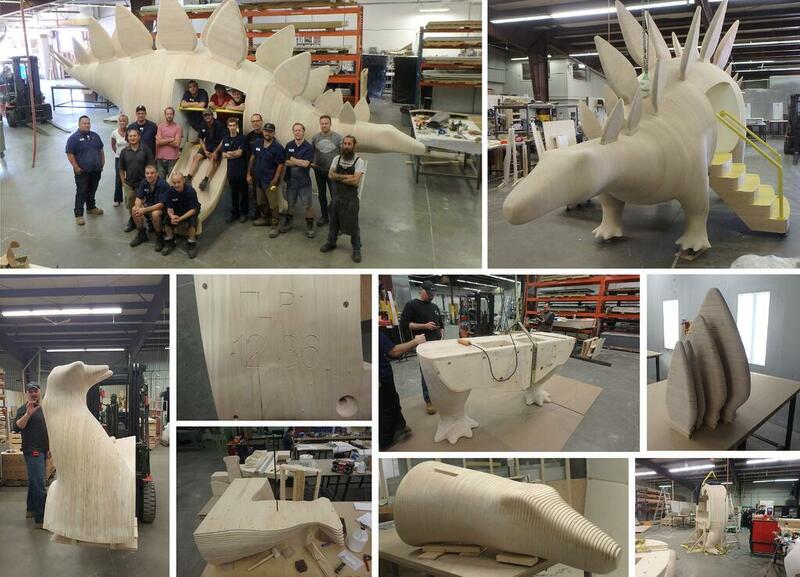 After over a year of development, Steggo has left YGD’s factory in Cambridge Ontario for the big city lights. He settled into his new pad in October and is adjusting to his serious stardom. Check out Steggo's first big screen appearance of the installation HERE. Huge thanks to ICrave for pulling this together. Fun fact: the man drenched in sweat is our operations manager, Mike Collins. We clearly don't question his hard work after seeing this. Taylor Swift didn’t lie when she sang “Welcome to New York”…“everybody here wanted something more…searching for a sound we hadn’t heard before”. Did someone say “Roar”? Welcome to New York. Now taking autographs. Check out the #oftenimitated #neverduplicated work of our collaborators ICRAVE and The Dermot Company. 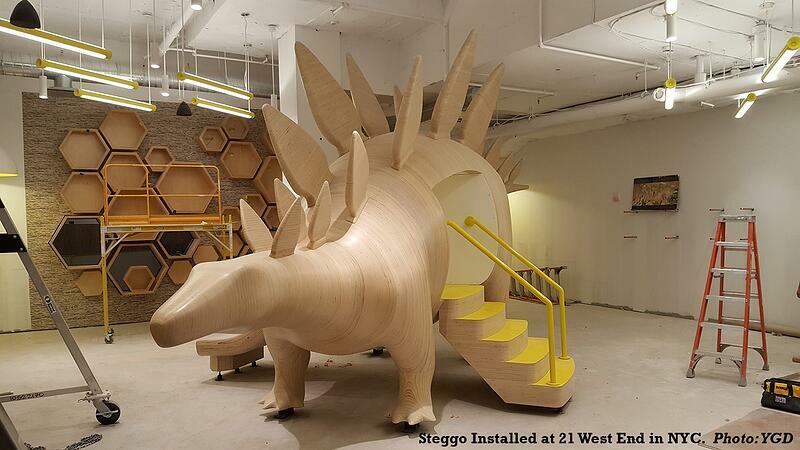 Want to snag a spot at 21 West End with Steggo? Visit the property's website here.